Chelsea players are reportedly discussing transfers with their agents as the Blues look under threat to sack manager Maurizio Sarri. According to the print edition of AS, translated by Sport Witness, Chelsea players do not want to stay at Stamford Bridge if Sarri is still in charge beyond this season. The report explains that this is due to a difficult in understanding the Italian tactician’s tactical instructions, and that seems a pretty clear problem judging by recent performances on the pitch. Chelsea suffered their worst ever Premier League defeat at the weekend as they were ripped apart by Manchester City in a 6-0 humbling. 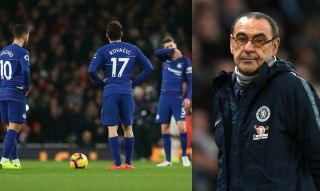 The Blues now face an uphill struggle to make it into the top four this season, so one imagines Sarri cannot last much longer. Roman Abramovich has a proven record of sacking managers quickly if things don’t work out, and reports like this just indicate he doesn’t seem the right fit for the club at all. This is unfortunate as his Napoli team played some superb football while he was in charge there, but he’s clearly been unable to work his magic here in the more challenging and competitive Premier League.